On this rainy February morning, I push the door of an unusual place in the heart of Chatou, city of 19th century painters, including the famous Derain and Vlaminck, were the creators of fauvism (or Chatou School). There, I discover with wonder a place out of time, the museum of the Dorin House. Discovery of this wonderful and fantastic universe with the owners, the Nasri family (Bashar and Imane). Michelle Vincent : How did this story start? H. Nasri : To tell you the truth, we don't know exactly when the Maison Dorin was founded. Probably during the last period of the Ancien Régime (perhaps 1745). Mademoiselle Montansier, a formidable businesswoman, a half-mondaine passionate about theatre, a friend of Marie-Antoinette and Bonaparte, had a theatre built in Versailles (today, Théâtre Montansier) inaugurated on 18 November 1777 in the presence of Louis XVI and Marie-Antoinette. She was, by royal privilege, its director, and officially responsible for organizing"shows, balls and parties after the Court". Thanks to her, the Maison Dorin will make itself known to the court by its rouge à joue for the theatre. He also thinks that this Miss Montansier bought the little Dorin shop in Paris and gave its name to a powder. MV They were also very innovative in a certain way; the catalogue of the time mentions precautions for certain substances (see page 1 and the recommendations of Prof. Reveil, in 1865 and the chemist L'Hôte in 1889) and of remarkable quality. 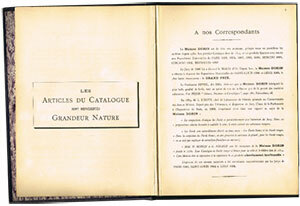 (We had the privilege to admire him) HN The 1914 catalogue is a real treasure. It was already translated into several languages at the time (English, Spanish, German…). The drawings are remarkable, hand painted in real size. It expresses in an extraordinary way the values of the mark, its requirement, the excellence of the execution and its precursor side; we are in 1914! Moreover, Dorin products have won numerous awards at world exhibitions: Moscow (1891), Chicago (1893), Brussels (1897), awarded a gold medal in Paris in 1900, Grand Prix in Saint Louis in 1904, Liège in 1905 and Brussels in 1922. This recognition of Dorin products has contributed to the brand's notoriety and to the opening towards new luxury markets in Russia, England, the United States and Spain. In the United States, Dorin was a pioneer in the development of compact powders. In New York, the expression"give me a Dorin" was very common and meant"Give me a lipstick". The name Dorin had passed into the common language, that is to say its popularity. MV In France, Dorin had factories, laboratories? HN Yes: Yes. 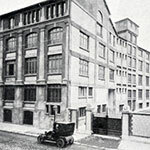 The Dorin factory was located at the corner of rue de Wattignies and rue de Fécamp, in the 12th century. They produced La Dorine perfumes, red brunette, ÉclatLys cream, powders… From 1936, Dorin set up its factory in Colombes alongside other major brands (Guerlain in particular). The plant has over 85 employees and exports Dorin products to some 20 countries around the world. The brand ceased its activity in the 1980s, dedicating itself exclusively to contract production for other houses. MV And today? HN : We took this beautiful sleeping beauty back in January 1998 with a whole collection of perfumes. 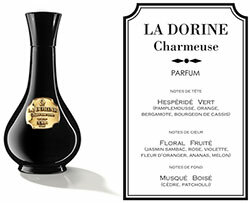 The most emblematic is La Dorine, in homage to Marguerite Brunet, known as Mademoiselle Montansier, composed of three juices: Charming, Passionate, and Romantic. But also Air de Paris, reissued in 2007, from the original formula of 1886, this great classic takes again the codes of the traditional perfume. It is available in floral, fruity and spicy versions. This contribution was made by Michelle Vincent. Graduated from ENSAM Montpellier (today SupAgro) in food sciences, Michelle began her career as Quality Engineer in the Intermarché group. During this first experience, she rubbed shoulders with SMEs and upstream sectors of the agri-food industry. In 1993, fate led her to a more glamorous universe, that of cosmetics. She joined Chanel in Neuilly sur Seine. His challenge: to set up a sensory analysis laboratory in order to optimize the galenics of cosmetic formulas. In 2008, change of direction for the professional press as editorial director. At the same time, at the end of 2012, she created her consulting firm to assist companies in the development of cosmetic evaluation methods and scientific content writing. Finally, she is a teacher at ISIPCA on modules of sustainable development, CSR, the natural sector. She has collaborated with the Cosmétothèque® since its creation.